When I was in middle school, our version of the “Beatles vs. Stones” debate was “Nirvana vs. Pearl Jam”. Arguments were waged, lines were drawn, and there was no safe passage for fence riders. I was firmly in the Nirvana camp and decried Pearl Jam as a “jam band” with pompous 70’s guitar solos and a poser front man. In truth, I really liked Pearl Jam too and just had a harder time learning their stuff on guitar. But as I said, you had to choose only one and Nirvana was it for me. 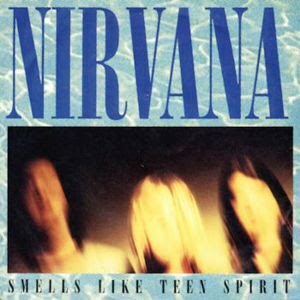 I remember the first time I saw “Smells Like Teen Spirit” on MTV and I was blown away. It not only looked really cool, it looked like something I could be a part of; a concert in a gymnasium, jeans and a t-shirt, and a guitar style that didn’t seem all that difficult or forced. I had to be tricky when buying Nevermind because my parents weren’t in the habit of getting me albums with naked babies on the front. But I succeeded in scoring my very own copy and without being hyperbolic, I can say that it literally changed my life. Nevermind was the first album that I ever remember really immersing myself in. Immersed as in constant, repeated listenings to get every lyric, vocal line and musical nuance. I didn’t understand what the lyrics were supposed to actually mean most of the time, but you didn’t have to. "How" Kurt sang and played was as important as "what" he was singing. His delivery conveyed the emotion he was going for much more than mere words could. Like tons of other kids my age, Nevermind, made me want to pick up a guitar and get it all out. Kurt made us believe that all of the confusion, isolation and general weirdness of growing up could somehow be waded through with a chuck of wood and some strings. The journey could even be advanced along if you were lucky enough to get your hands on a distortion pedal too! My parents bought me my first guitar for $60 off of a friend from church. It was a cheap Les Paul knock-off, had a neck like a telephone pole and was the heaviest thing I had ever strapped on. I was in love. It was the most beautiful inanimate object I had ever seen. The blisters on my fingers were glorious war wounds and the cramping in my neck was a labor of love I gladly endured for the chance to be on this journey. While I was learning to play guitar, Nevermind, was one of my most trusted road maps. The first riff I ever learned to play was “Come As You Are”. The first full song I learned to play from top to bottom was “Smells Like Teen Spirit”. Sure I learned other people’s songs, but I was determined to get the whole Nevermind album down. Even if I could never get my voice to get that razor-sharp wail in it, I could almost get my guitar to sound like it was speaking the same language as his. But that’s like saying that a toddler and Shakespeare both speak English. The first concert I ever played as a “band” was in the summer of 1995. I had started playing around after school with my friends Rusty, Ryan and Geoff and we were all learning together. Geoff’s sister Rebecca was having a birthday party and wanted us to play for it. That’s the kind of motivation you need when you are starting out so you can transform from aimless to motivated. We had to actually learn some songs! Somehow I got roped into singing as well and we did our best renditions of “Smells Like Teen Spirit”, “When I Come Around” by Green Day, “Come Out And Play” by The Offspring, “Zombie” by The Cranberries, “Plush” by Stone Temple Pilots and a few others. I remember singing horribly off-key, playing the guitar line to “Zombie” on the wrong string, trying to stage dive onto people that where standing right in front of me and having a great time doing it! Everyone, including the awe-struck crowd, had a blast! Somewhere there is a video floating around of the show and hopefully it never sees the light of day again! Even now, whenever I hear those first few clean guitar chords being chunked out or watch the “Smells Like Teen Spirit” video, I am instantly transported back to a place of beginning and discovery. It’s truly a magical thing. It speaks not only to the power of music but to the power of specific artists who's music can find a way into your life at crucial moments, guide you into new areas, and never leave you once they are done showing you things. Maybe that's the thing, maybe the illumination is not just a one time thing. I don't know what "with the lights out, it's less dangerous" means, but I know how I felt when I sang it then and how I feel when I sing it now.